Following up on a spectacular success in Michigan, Wassim Sarweh is taking his show on the road to New York! Learn the history, rhythm, notation, vocal techniques, modes and psalm tones of Roman Chant. This course will include discussion of both the Ordinary and Extraordinary Forms of the Roman Rite, as well as use of English and Latin in the Liturgy. Heretical Hymns, World Music, and Keeping Your Job? Below is a sneak peak at some of the morning breakouts we have to look forward to at this year’s Sacred Music Colloquium in Salt Lake City. Remember that if you register during the Octave of Easter a copy of Dr. William Mahrt’s The Musical Shape of the Liturgy will be on its way to you in the mail. Chants are some of the oldest religious music genres of the world, and their centrality in Buddhist, Hindu, Judaic, Christian and Islamic worship cannot be over emphasized. In the Christian Church alone, one can name Byzantine, Ethiopian, Anglican, and Gregorian chants, for example, as indispensable vehicles of religious worship. This lecture explores the significance and uses of chants in some world religions. It will focus specifically on Gregorian Chant in the Roman Catholic liturgy. The traditionalism and canonicity that Gregorian Chant enjoyed for centuries was disputed by the Second Vatican Council, which encouraged the use of other forms of world music as backdrop in the liturgy. The introduction and use of world music in the liturgy has fostered the continuous decline of the use of Gregorian Chant, an issue that has become a cause of concern among sacred music scholars. The dilemma of whether or not the Roman Catholic liturgy is a common ground where tensions can be resolved persists today. Although sung Propers are always the best choice for the Mass, parish musicians are still often called upon to select hymns for Mass, devotions, and the Liturgy of the Hours. Choosing among the various options can be a daunting task. This lecture begins with an examination of the importance of hymns in the Church from apostolic times, preceding the Reformation by many centuries. Then, individual hymns will be sung and analysed for their usefulness in teaching and evangelization, focusing primarily upon textual and theological considerations. This practical course will show you how to maintain and strengthen your current position and program, whether you are music director of a large parish or direct a small choir. Special emphasis will be given to changing the direction of a program, with positive advice for how to do so while keeping your leadership role secure. The registration deadline for the 4th Annual Musica Sacra Florida Gregorian Chant conference is this Friday, March 30th. If you haven’t registered yet, find out more and register. You and your choir are cordially invited to attend the 4th annual Musica Sacra Florida Gregorian Chant Conference, to be held at Ave Maria University on April 13th and 14th. This year’s conference will have two new features. Participants will get to sing Latin and/or English chant in the closing Mass of the conference, which will be on Saturday, April 14th, at 5pm. This will be an anticipated Sunday Mass for the 2nd Sunday of Easter (Divine Mercy Sunday). The conference is open to musicians, clergy, and parishioners. All are welcome! You will love this incredible image gallery of the Cathedral of the Madeleine, which is hosting the Sacred Music Colloquium. There is a world of treasures in the Catholic music world, and they are all there for us if we are willing to take the step. You can discover this whole world and bring your discoveries back to your parish, so that it can become a place where heavenly beauty has a home. Come to the Sacred Music Colloquium in Salt Lake in June. It’s one week that will change your life forever, and provide benefits to your parish for decades to come. Wonderful report on this event (everyone I know wanted to be there) in the UK, written by Joseph Shaw. Yesterday I chaired the second biennial meeting of the Gregorian Chant Network, which was founded at the first meeting two years ago. Yesterday’s meeting was addressed by Dr James MacMillan, the composer, Fr Guy Nichols, the founder of the Newman Institute of Music in Birmingham, and myself; it took place in the London Oratory, and concluded with Vespers in the Little Oratory celebrated by Fr Andrew Southwell, LMS Chaplain. 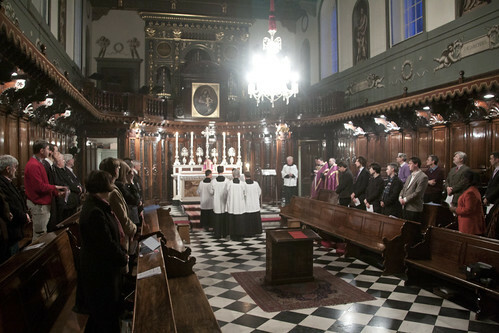 The meeting was attended by directors of Catholic chant choirs from all over the country, chant experts, and representatives of the organisations which support the Chant Network: as well as the Latin Mass Society, Una Voce Scotland, the Association for Latin Liturgy, the Schola Gregoriana of Cambridge, and the St Catherine’s Trust. I can now announce that we have two more institutional supporters: the Ordinariate of Our Lady of Walsingham, and the Bl John Henry Newman Institute of Music. The meeting also included two chant directors from France, Mr Phillipe Nikolov and Mr Henri de Villiers (also of the New Liturgical Movement), who represented Una Voce France; and Mr Thomas Murphy, of St Conleth’s Catholic Heritage Association, the Irish affiliate of the Una Voce International Federation. Dr Macmillan addressed the audience of just over 50 on the significance of Chant in the musical patrimony of the Church. You can listen to his talk here. After lunch I gave a report on the progress of the GCN over the last two years, and introduced Fr Guy Nichols, who spoke about the work of the Newman Institute. We then rehearsed for Vespers, and celebrated Vespers together after tea. The whole day was a great opportunity to meet other people working for the cause of Chant in the Catholic Church, for mutual inspiration and support. It was very kindly hosted by the London Oratory, in the St Wilfrid Hall and the St Joseph Hall. Dates: June 25-July 1, 2012. This year we are expanding in new directions. You do not need to regard yourself as a singer or even a musician to attend. There are plenty of Gregorian choirs for first-time singers, and sessions are available for those who opt not to sing in a polyphonic choirs. There will be opportunities for both professional musicians and non-musicians who are just interested in the well-being of music at liturgy. The venue of the Cathedral in Salt Lake is beautiful beyond description. Historically significant as well as aesthetically magnificent, the Cathedral of the Madeleine ranks among the finest locations ever made available for the Sacred Music Colloquium, which has grown in size in scope every year for six years. Individuals and organizations interested in sponsoring the Colloquium with full page ad in the Colloquium packet, write programs@musicasacra.com. The year 2012 promises to be the grandest ever with new opportunities for learning, singing, listening, and interacting with the best minds and musicians in the Catholic world today. The Cathedral Choir School has been wonderfully accommodating and opened up the full use of its facilities for the Colloquium. You will have the opportunity to see how the Choir School functions, experience the amazing acoustic of the Cathedral, study under the best conductors and intellectuals in the entire Catholic music world, and form new friendships that you will value for years to come. 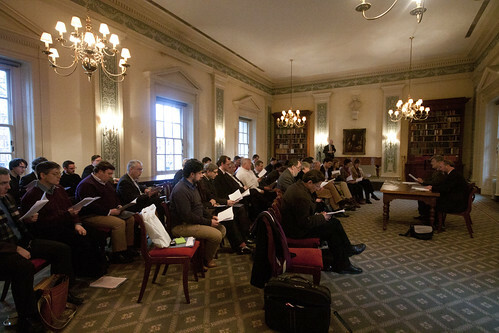 The primary focus of the Colloquium is instruction and experience in chant and the Catholic sacred music tradition, participation in chant choirs, daily and nightly lectures and performances and daily celebrations of liturgies in both English and Latin. You are there not merely as an attendee but as an integral part of the greatest music you will ever experience. It will will touch your heart and thrill your artistic imagination. Attendance is open to anyone interested in improving the quality of music in Catholic worship. Professional musicians will appreciate the rigor, while enthusiastic volunteer singers and beginners new to the chant tradition will enjoy the opportunity to study under an expert faculty. Those who choose not to sing at all but merely want to learn will find a once-in-a-lifetime opportunity to absorb the full ethos of a world of the best liturgical music. Do you want to make this trip your family vacation? There are so many things so see and do in the Salt Lake City area. Once registered, there is no required sign up for individual choirs, scholas, or breakout sessions. Attend as suits your needs. All music, including prepared packets of chant and polyphony, as part of registration. Salt Lake City is one of the most beautiful cities in the world, with some of the finest dining, mountainous views, and nicest people anywhere. Under the leadership of the Right Reverend Lawrence Scanlan (1843 – 1915), the first bishop of Salt Lake, the construction of The Cathedral of the Madeleine was begun in the year 1900 and completed in 1909. On August 15 of that year, the cathedral was dedicated by Cardinal James Gibbons of Baltimore. The architects were Carl M. Newhausen and Bernard O. Mecklenburg.The exterior of the cathedral remains substantially the same today as it was in 1909. The interior of the cathedral was largely created under the leadership of The Right Reverend Joseph S. Glass, who became Bishop of Salt Lake in 1915. A man of refined taste and strong artistic sensibility, Bishop Glass enlisted the aid of John Theodore Comes, one of the leading architects in America at the time, to undertake beautification of the original plain interior. The Comes interior, begun in 1917, was inspired in great part by the Spanish Gothic of the late Middle Ages. the colorful murals were added at that time, as was the dramatic polychrome evident throughout the building. The ornate reredos shrine of St. Mary Magdalen and the various shrines were notable features of the Comes renovation. Under the leadership of The Most Reverend William K. Weigand, who was appointed bishop of Salt Lake City in 1980, a much needed restoration of the interior, which had suffered the effects of dirt and pollution in the intervening decades, was planned and executed. The results are on full display today in breathtaking beauty. Traditional Latin Mass in Miami for the first time in 40 years. Standing room only. Organizers ran out of programs. Story 1 and Story 2. Another chance to study with Wassim Sarweh. This Advanced Chant Workshop is designed for choral directors and accompanists: Feb. 4th 2012 from 9AM to 3PM at St. John the Baptist Catholic Church, 411 Florence Street, Ypsilanti, MI 48197. Registration is $35 which will be paid at the event. Financial assistance is available. Register here.